Imagine if you could make it fun for your kids to tidy up their toys, so it becomes something they do naturally - wouldn&apos;t that be amazing? Step 1 — Gather a group of toys that get a lot of use! Step 2 — Find some LEGO plates and bricks — for each toy you&apos;ll want one small LEGO brick on the toy, and a LEGO plate on the wall to attach to. Step 3 — Use Sugru to stick the LEGO pieces where you want them. 24 hours later, the Sugru will have cured into a tough and tactile rubber. Your kids will love being able to click and organise their favourite characters on the wall, and you&apos;ll get the satisfaction of feeling a little more organised at home — win win! 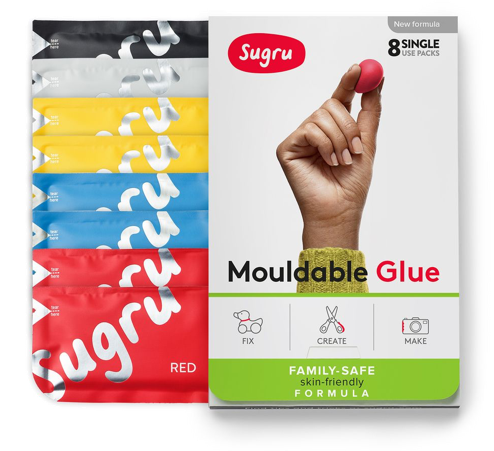 Sugru is great for this project as it fills weird gaps and bonds to almost everything, particularly hard plastics so, chances are, it&apos;ll bond to what you need it to. Take a wander around your house and keep a look out for things that you could improve with Sugru + LEGO — like making a handy place for your keys, this genius idea to organise your TV cables and accessories, or different ways you could adapt things so that they work better for you. Check out our video for loads more Sugru + LEGO ideas. This idea was dreamt up by Juliane who made an awesome LEGO spaceport for her son!